2.0 Box Office Day 1: The year 2018 has been a roller coaster ride in terms of Bollywood Movies’ making a place for themselves a box office charts. From starting the year with Ranveer Singh, Shah Kapoor and Deepika Padukone’s Padmaavat to the recent Aamir Khan’s magnum opus Thugs Of Hindostan, here’s where Akshay Kumar – Rajinikanth starrer 2.0 stands on the list of Top 10 opening grossers of the year. 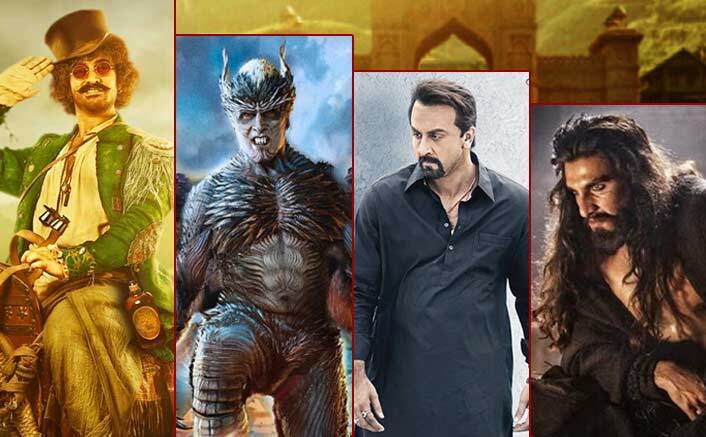 The list tops with none other than Thugs of Hindostan which gathered a massive amount of 50.75 crores on its Day 1 and ended up breaking all-time opening day records at the box office. Next on the list stands Ranbir Kapoor’s Sanju that won hearts along with numbers garnering 34.75 crores. Just like Thugs.., Salman Khan’s Race 3 had massive pre-release hype and might have eventually disappointed but had made whopping 29.17 crores on its first day. This is followed by Gold (25.25 crores), Baaghi 2 (25.10 crores), Padmaavat (24 crores), Satyameva Jayate (20.52 crores), Veere Di Wedding (10.70 crores), PadMan (10.26 crores) and Raid (10.04 crores). 2.0 Box Office: 128 Crores Of Baahubali 2 & 120.06 Crores Of Sanju – Possible In An Extended Weekend? Talking about the Rajinikanth starrer 2.0, it has earned a total amount of 20.25 crores which means it has surpassed Veere Di Wedding, PadMan and has thrown Raid out of this list. The movie places 8th on the list. Although the expectations were much higher but considering the release which took place on a working day, the numbers are good and are expected to increase gradually breaking some records and surpassing many hits on its way! 2.0 along with Rajinikanth, Akshay Kumar, also stars Amy Jackson in a pivotal role. It hit the theatres yesterday, that is, on 29th November. The post 2.0 Box Office Day 1 (Hindi): 20.25 Crores VS Top 10 Openers Of 2018! appeared first on Koimoi. Dhadak Box Office Day 2: 11.04 Crores VS Student Of The Year VS Kis Kisko Pyaar Karoon! 2.0 Box Office Day 14 Early Trends (Hindi): With A Decent Grip, Inching Towards The 200 Crore Club! Simmba Box Office Day 1: From 25 Crores To 34 Crores – Ranveer Singh’s To Rohit Shetty’s Highest – Records To Break! Thackeray Box Office Day 5 (Hindi + Marathi): Footfalls Slow Down! Captain Marvel Box Office Day 1 (India): 12.75 Crores VS Avengers: Infinity War, The Fast & The Furious Franchise & More!